Born Sutton Coldfield 1946. Double bass, bass guitar. Nick Stephens started his first group aged 14, playing bass guitar, with schoolfriend guitarist Dave Cole. Through their teenage years they played the pubs, clubs, dance halls and US Bases of the UK and Europe. At 21 he returned home, bought a double bass and joined the Midlands Youth Jazz Orchestra. Here he met and played with Dave Panton and Jan Steele. And then, Stephens, says, "One afternoon a hurricane of energy with a snare drum under his arm and the look of Rasputin, burst into the orchestra rehearsal room. It was my first experience of a John Stevens workshop." In 1975 Nick Stephens took his bass guitar to Riverside Studio for a blow with John Stevens and Trevor Watts who were re-forming 'Away' This marked the beginning of a long friendship and musical partnership between Stevens and Stephens. A record deal with the Phonogram Vertigo label produced 3 albums and 2 singles, one of which - 'Annie' - an Alternative Charts topper, featured John Martyn. Away made regular radio broadcasts and appeared twice on BBC Two's Old Grey Whistle Test. They played two national tours of large rock venues - one with The Jazz Crusaders and opposite Ornette Coleman at London's Victoria - but John never lost sight of the collective, group improvisation ethic that he had first nurtured in the SME and at The Little Theatre Club. Nick continued to work with John until his death in 1994 playing in The Dance Orchestra, Folkus, Freebop, Fast Colour and umpteen small group gigs and workshops. In 1988 Stephens received his first of two Arts Council Bursaries for composition and formed the Nick Stephens Septet. In 1994 Stephens and Frode Gjerstad formed Calling Signals with Paul Rutherford and percussionist Terje Issungset. Alongside Stephens and Gjerstad, later incarnations of the group have featured: Louis Moholo-Moholo, Hasse Poulsen, Paal Nillsen-Love, Lol Coxhill and Jon Corbett. 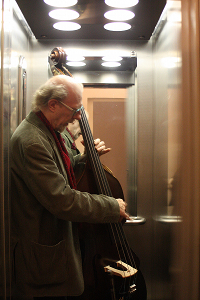 Stephens is also a member of Gjerstad's international improvising orchestra the Circulasione Total Orchestra. In 2005, to make available music that has escaped documentation and as an outlet for new recordings, Nick Stephens started the Loose Torque label. 1976,	Old Grey Whistle Test Take 2,	BBC Records BEDP001. Away on one track. 1976,	Somewhere In between,	Vertigo 6360 135. John Stevens Away. 1976,	'Mazin ennit',	Vertigo 6360 141. John Stevens Away. 1976,	John Stevens' Away,	BGO Records BGOCD1198. 2CD set of John Stevens Away, Somewhere In between and Mazzin ennit. 1977,	Ah!,	Vinyl Records VS111. John Stevens Dance Orchestra. 1977,	Conversation piece,	Konnex KCD5025. John Stevens. 1977/1978/1980,	Mutual benefit,	Konnex KCD 5061. John Stevens Away. 1977/1979/1981,	A luta continua,	Konnex KCD 5056. John Stevens Dance Orchestra. 1978,	Integration,	Away Red Records RED 009; reissued on Loose Torque LT005. John Stevens Away. 1978,	At home	Loose Torque LT025. John Stevens Away. 1981,	Late for lunch	Loose Torque LT006. Stevens/Topping/Stephens. 1981,	David Panton Trio,	PM185. Panton, Stevens, Stephens. 1981	Riot At The Hamborough Tavern,	Wenlock Wen008. Volume 33. 1981	Dave Panton's One Music Trio,	Nondo FMC3. Panton, Stevens, Stephens. 1982,	For some cats,	Nondo FMC5. Dave Panton Trio: Panton, Stevens, Stephens. 1983	Accent,	Circulasione Total 010. Accent: Gjerstad/Garred/Stevens/Stephens. 1984,	In off,	Circulasione Total 014. Accent: Gjerstad/Garred/Stevens/Stephens. 1986	Live tracks,	Impetus Records IMP18610. Freebop. 1988,	Antwerp 1988	Loose Torque LT001. Fast Colour. 1990,	The Bible says,	Impetus IMPCD18921. Conglomerate. 1990	Live at The Plough Stockwell,	Loose Torque LT007. Nick Stephens Septet. 1991,	In 91,	Loose Torque LT017. Dangerous Musics. 1996,	Calling signals,	Loose Torque LT004. Frode Gjerstad/Louis Moholo/Hasse Poulsen/Nick Stephens. 1997,	North Atlantic drift,	Falçata-Galia FALÇ-0024/Loose Torque LT002. Gjerstad/Stephens. 2003,	This that and the other,	Loose Torque LT003. Lol Coxhill/Frode Gjerstad/Nick Stephens. 2003,	Live at the Termite Club,	Loose Torque LT009. Frode Gjerstad/Nick Stephens/Paul Hession. 2003,	Uproot,	Loose Torque LT009. Improvidence. 2005,	Breaking Silence,	Loose Torque LT010. Trio FO. 2005,	Today's play,	Loose Torque LT011. Jon Corbett/Nick Stephens/Tony Marsh. 2005,	Born in Brooklyn,	Barking Hoop BKH-010. Instinctual Eye. 2005,	Dreams in dreams,	FMRCD177-i0805. Calling Signals. 2005,	Calling Signals Live in the UK,	FMRCD181-i10055. Calling Signals. 2006,	Desire lines,	Loose Torque LT012. The Occasional Quartet. 2006,	Freedom of the city 2006,	Emanem 4139. One track by The Occasional Quartet. 2006,	Don't answer it,	Loose Torque LT013. The Schizo Quartet. 2006,	The play's the thing,	Loose Torque LT014. Jon Corbett/Nick Stephens/Tony Marsh. 2006,	What goes around...,	Loose Torque LT015. The September Quartet. 2006,	Epiphany,	FMRCD209-0906. Circuit Electro Acoustic Ensemble. 2007,	All said and Dunn,	Loose Torque LT016. Paul Dunmall/Nick Stephens/Tony Marsh. 2007,	Quiddity,	Loose Torque LT019. Gjerstad/Stevens/Moholo-Moholo. 2007,	From Cafe Sting,	Loose Torque LT020. Calling signals 07. 2008,	From Cafe Oto,	Loose Torque LT018. Calling signals 08. 2008,	A winter's tour,	Loose Torque LT021. Calling signals 09. 2008,	Open port,	CT09 Circulasione Total Orchestra. 2008/2009,	Bandwidth,	Rune Grammofon RCD2089 (3CD). Circulasione Totale Orchestra. 2009,	Kongens gade,	Leo Records LR 617. Jon Corbett's Dangerous Musics9. 2008/2009/2010,	Different times,	Loose Torque LT022. Frode Gjerstad/Nick Stephens. 2010,	Attic antics,	Loose Torque LT023. Fred Lonberg-Holm/Nick Stephens. 2010,	Free play,	Loose Torque LT024. Corbett/Stephens/Marsh. 2010,	Live in Chatham,	FMRCD290-0410. Atmospheres without Oxygen 3. 2010,	Live in Oxford,	FMRCD295-0810. Atmospheres without oxygen 4. 2010/2011,	PhilaOslo,	CT12 (2CD). Circulasione Totale Orchestra. 2011,	Crackle,	Loose Torque LT026. Fred Lonberg-Holm/Nick Stephens.